Since the first trampoline park in Canada opened in 2011, others have been popping up across the country — and with them comes the risk of serious injury. Marketplace visited 12 trampoline parks across the country to see what was being done to mitigate risks to minors in this unregulated industry. When eight-year-old Chelsea Garrod jumped off a platform into a foam pit at a trampoline park in Kelowna, B.C., she thought she'd land like a flying squirrel. Instead, she landed in the hospital, unable to feel her legs. More than a year later, Chelsea is still recovering, with a fractured spine and significant nerve damage. She can walk again, but her physiotherapist says her nerve damage is permanent and her back will never be the same. "When I hit the foam, I heard a crack and it really hurt," said Chelsea, recounting the day it happened. By evening, Chelsea couldn't feel her legs and had to be airlifted to the hospital. "I didn't cry when it happened; just sometimes after, when I got really scared," she said. Injuries like Chelsea's are not unique. Last year, news of young adults, like Landon Smith and Blake Davies, becoming paralyzed in trampoline parks in Alberta and Ontario made national headlines. And earlier this year, a 46-year-old father died at a British Columbia trampoline park in front of his two young daughters. Since the first trampoline park in Canada opened in 2011, others have been popping up across the country — and with them comes the risk of serious injury. Marketplace visited 12 trampoline parks across the country to see what was being done to mitigate risks to minors in this unregulated industry. Many children were witnessed breaking the parks' "rules" without employee intervention. After her back was fractured, Chelsea Garrod had to wear this brace. (Submitted by Sylvie Gilbert)Staff at Energyplex Family Recreation Centre, for example, watched as multiple children belly-flopped into the same foam pit where Chelsea broke her back doing the same stunt. No one intervened. At other parks, Marketplace documented flips, stunts and double-bouncing — all considered risky behaviour by health authorities. Children were observed jumping head first into foam pits, and at times, areas of the parks had no supervising staff to enforce safety rules. At one park, a baby crawling across a tumble track collapsed after being bounced by an older child. At another, a mother held her crying toddler after he did a somersault and landed on his neck. The trampoline park industry is not regulated in Canada, which means that while one park may have a six-foot-deep foam pit, another may only be three feet deep. The parks are left to inspect and repair their equipment themselves, and don't have to report injuries. However, the Canadian Hospital Injury Reporting and Prevention Program (CHIRPP) is keeping track of children who present at a hospital with trampoline injuries, with 18 hospitals participating in their program. "A lot of people don't realize how significant the injuries are," said Dr. Laura Purcell, founding president of the Canadian Paediatric Society's paediatric sport and exercise medicine committee. Purcell has been studying trampoline injuries for more than a decade and has co-authored research papers for CHIRPP. "When you look at the severity of injury — meaning how the injury needs to be treated — the admission rate for injuries sustained with trampolines is much higher than a lot of other sports," said Purcell. A 2007 study showed trampoline-related injuries have the second-highest rate of admission to hospital out of all sports and recreation injuries in the CHIRPP database, with 12.4 per cent of injured patients having to stay overnight. It followed only alpine skiing, which saw an overnight-stay rate of 12.9 per cent. In contrast, ice hockey saw only 3.3 per cent of injuries be serious enough for overnight admittance, and football, only 2.8 per cent. Since the boom of trampoline parks across Canada, CHIRPP has been looking specifically at the difference between backyard-trampoline and trampoline-park injuries. 'My bone was 3 inches out of my leg': Injuries prompt call for indoor trampoline park regulation in Sask. Purcell published another study this year, which revealed there is a much higher percentage of face and neck injuries arising from stunts like somersaults and flips in trampoline parks (36%) compared to backyard trampolines (13%). "We do see injuries to the neck and spine," she said. "The concern with those is that they can lead to long-term paralysis and significant impact on quality of life down the road." Health Canada has been advising against somersaults on trampolines since 2005, stating that "landing on your head or neck can cause paralysis" and "somersaults are advanced skills that should only be performed in an appropriate facility under the guidance of a certified instructor." However, at every trampoline park visited by Marketplace, children were observed doing somersaults without staff members intervening. And a search of each of the 12 parks' websites and social media material show somersaults are often encouraged through promotional ads, including those geared toward children. Many health organizations, including Health Canada, also advise that children under six should not use trampolines at all, since they don't have the motor skills and strength to jump on a trampoline. But many parks had specific areas devoted to "toddler time," when parents were encouraged to bring young kids to jump. Is regulation going to help? Other authorities, like Parachute Canada — an advocacy group that seeks to prevent serious or fatal injuries through education — go further, recommending no recreational trampoline use at all. While preventative measures implemented for other sports have been proven to reduce injuries, like helmets for bicycling and wristguards for skateboarding, Purcell says this isn't the case for trampolines. "All the safety precautions that have been suggested for trampolines have not affected the incidence of injuries associated with those activities," she said. The park where B.C. father Jay Greenwood died in January is still seeing injuries, for example, including some in the past month. A three-year-old boy fell through a trampoline onto the concrete below, and just days later, a 10-year-old girl fell from the climbing wall, breaking her arm, leg and wrist, and fracturing her face. When Marketplace reached out to Extreme Air Park, in Richmond, B.C., the owner said the park has safety protocols and rules in place, and "it is unreasonable to assume our team can be at all places at once." The boy was playing with the Velcro on the trampoline and "slid three feet to the floor through the Velcro he compromised," the owner said. And the 10-year-old shouldn't have clipped into the harness herself, and is "old enough to understand direct instruction given to her," he said. 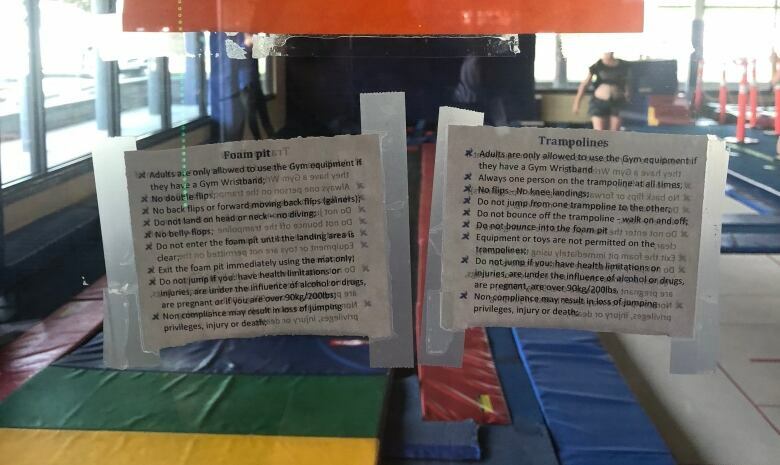 The onus is often put on children to jump within their own ability, and for parents to stop their kids from doing anything dangerous, as outlined in the parks' liability waivers, which jumpers are required to sign before entering any trampoline park. The liability waiver is a legal document by which the signee assumes the risk of the activity — even if an injury is the result of the establishment's own negligence or poorly maintained equipment. Many waivers outline all the ways their facility may be unsafe, and the many ways staff could be negligent. These documents are legally binding when an adult signs them. However, several lawyers told Marketplace they are more complicated when a parent signs on behalf of a child. "A child can't be bound to a contract," said Darren Williams, a B.C.-based personal injury lawyer who is representing Chelsea Garrod in a lawsuit against Energyplex. "When a parent signs on behalf of the child, they can't contract away the child's rights to sue if they're injured." Although Williams cannot specifically talk about Chelsea's case, as it is before the courts, he has dealt with many cases involving waivers. "People are so used to seeing them nowadays that they just assume that they're effective, and that essentially scares away a large number of people from bringing rightful claims," he said. Marketplace brought the results of the hidden camera survey to the trampoline parks featured. Many told us that safety is their top priority and some said they would welcome government regulation. Some also mentioned they follow the American Society for Testing and Materials (ASTM) standard for trampoline park safety, which was established in collaboration with industry stakeholders to standardize the way trampoline parks are manufactured and run. There are currently no inspections in Canada, and following the industry standards is voluntary. Many parks also told Marketplace they have signage and a posting of the rules that warn about the risks. Some parks noted Health Canada's current recommendations are from before the existence of trampoline parks in Canada and should only be read in the context of backyard trampolines. Although Parachute Canada and Health Canada have not spoken out about trampoline parks specifically, Purcell says parents shouldn't wait for an official statement. "Parents considering taking their children to trampoline parks should be aware of all the recommendations regarding trampoline use by children," she said, "including those organizations that recommend no use at all."